A light and luxurious wrap that feels like a whisper … perfect for those balmy nights! You may have seen me stitching away at this wrap on Instagram. I was given a gorgeous hank of Manos Del Uruguay Marina and I’ve been waiting for just the right pattern to use it. 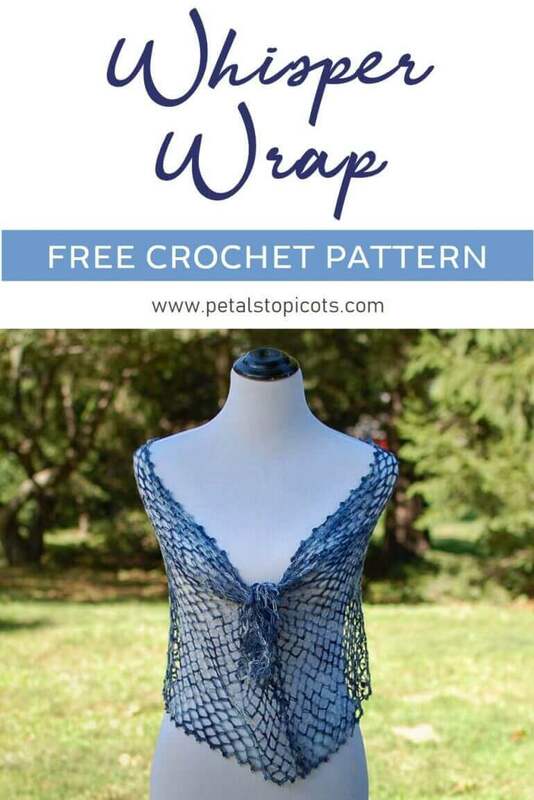 It’s a luxurious lace weight merino wool yarn so I wanted something that would show off the soft fiber and rich tonal colors, and this Solomon’s Knot Whisper Wrap Crochet Pattern is just the one! Finished shawl measures 38 in. long × 18 in. wide as written and blocked. Solomon’s Knot (sk) – Draw up a loop on your hook about ½-in tall, chain 1, single crochet through back loop of long chain, one Solomon’s Knot made. Row 1: Work 1 sc in 2nd chain from hook, work 110 sk across (or longer if desired to an even number of sk), turn. Row 2: Work 3 sk, skip 1st sc from previous row and work 1 sc in next sc (this will be the 5th sc from your hook), *work 2 sk, skip next sc and work 1 sc in the following sc, repeat from * across, turn. Row 3: Work 3 sk, skip 1st sc from previous row and work 1 sc in next sc (this will be the 5th sc from your hook), *work 2 sk, skip next sc and work 1 sc in the following sc, repeat from * across, turn. Rows 4 through 35: Repeat Row 3 until Row 35 or until desired width in reached, turn. Ch 1, 1 sc in first sc from previous row, *ch 4, [1 sc, ch 1, 2 dc, ch 1, 1 sc] in next sc, ch 4, 1 sc in next sc, repeat from * across and down side edge of piece. If desired, you can add a bottom beaded edge as described below or continue from * across bottom edge and remaining side. If adding beads to your edge, place each bead between the 2 dc, that is … work 1 sc in first sc, *ch 4, [1 sc, ch 1, 1 dc, place bead, 1 dc, ch 1, 1 sc] in next sc, ch 4, 1 sc in next sc, repeat from * across. To add a bead, drop hook from loop, using a smaller hook if needed, place bead onto hook and back into dropped loop. Pull loop through bead and continue with pattern switching back to original hook if necessary. 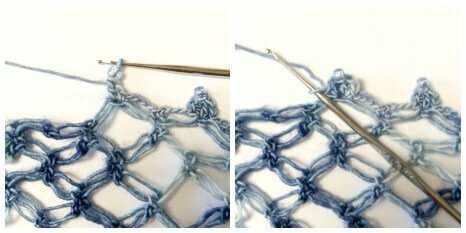 Repeat this for each stitch that you would like to add a bead. Beautiful pattern! The finished product is stunning. I did run across a few issues though. Row 2 should start with only 2 sk or you end up with an extra stitch on the end. And, on the edging instructions and the beaded edging instructions, the * needs to be before the ch4 so it’s included in the repeat. Finally, on the edging instructions, I’m not sure why there is a dc AND 2 dc in the repeat. It makes the picot unbalanced. Maybe I’m missing something. I just omitted the the lone dc and worked the 2dc and it looks fine. The lace yarn is so tiny and blocking makes the picot really look good. Again, the wrap is just beautiful! Thank you for making the pattern available! Hi Mitzi 🙂 So glad you liked the pattern!! 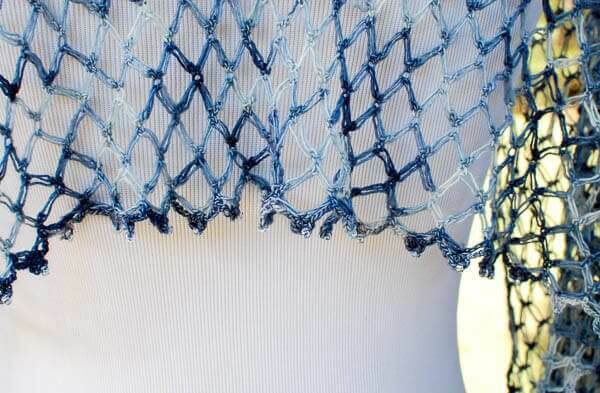 For the repeat that begins on row 2, I purposely added an extra sk to the traditional stitch pattern because I was going for a triangular pointed edge effect along the sides to mirror the top and bottom. Thanks for the catch on the picot edging; I moved the * to before the first ch 4. As for the dc, the 2 dc directions should be for without the beads and the 1dc,1 dc directions are for with placing a bead between. Hope that helps!! I would love to make this for my granddaughter who is getting married next May, but I don’t know if I can do it. I am a crocheter but I am not very experienced and I was wondering if you have a tutorial on You Tube. Thanks. Is there a certain number of stitches we need to make it longer? E.g. most patterns say something like, “multiples of 7, plus 2”. I have a friend who would absolutely love this but 38″ would barely cover one off her shoulder.